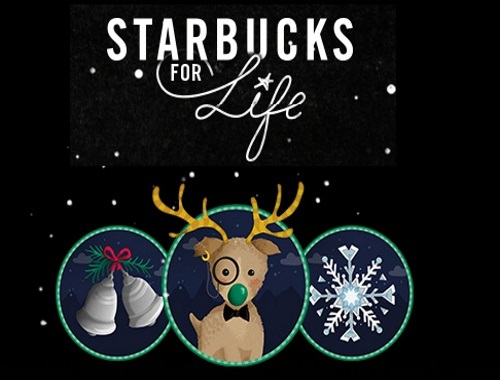 Starbucks for Life Holiday Edition Contest is back! Enter to win Starbucks for Life, for a Year, a Month, a Week, 125 bonus stars or 50 bonus stars! There are also instant win prizes of 5 Bonus stars! Earn plays by visiting a Starbucks store this holiday season and paying with your Starbucks app or your registered card now through January 16. You can also enter without making a purchase by visiting this link and following the links and instructions to complete and submit an entry form. An email with a unique link will sent to your email address you provided on the form. Click on the unique link to enter the Promotion Site and sign into your Account. Every play earns a game piece or an instant win prize. Collect three pieces in a row to win Starbucks for Life and other great prizes, so many possibilities. You can get a maximum of 2 plays per day. Bonus Offer - The first 30,000 entries that register for the promotion and play the game will receive 3 bonus tars which will be added automatically to their Starbucks Rewards account! Contest ends January 16, 2017. Click here to play Starbucks for Life.